Celtic necklaces feature unending lines that symbolize the beliefs of eternity and never ending love. Add to your rich Celtic heritage with any of these Trinity, spiral and knot-work pendants. 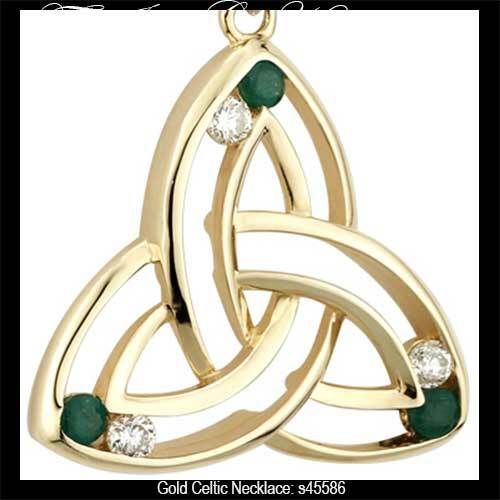 Select from a multitude of over 300 different Celtic necklaces that range from the motherhood knot to heart shaped pendants with knot-work designs along with Trinity lockets too. 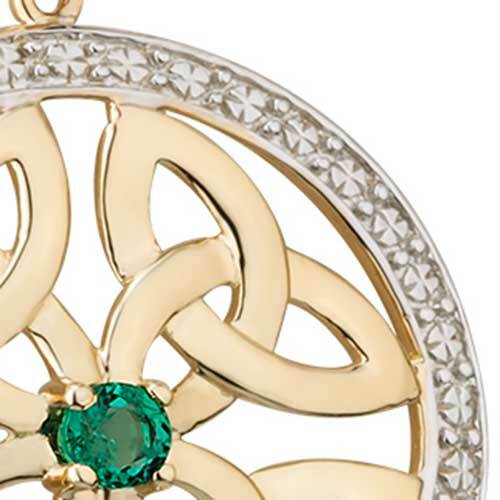 Every Celtic pendant offered at The Irish Gift House is made in Ireland and every precious metal piece is hallmarked by the Irish Assay Office at Dublin Castle. You may select from gold Celtic necklaces that are made in a variety of combinations or choose from classic sterling silver. We also have additional designs that include plated, pewter and stainless steel. These Celtic pendants are also available with a plethora of accents that include precious stones that range from diamonds and emeralds to semi precious stones that include Connemara marble and crystals. With so many traditional styles and contemporary designs at The Irish Gift House you are bound to find the perfect Celtic necklace. Celtic necklaces are grouped by metal type in the above specific categories or you may scroll down to see all our selections in one place. 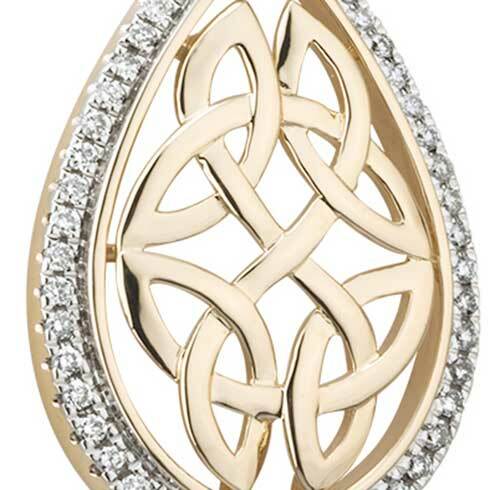 Dara knot necklace is a 14K Celtic design with a diamond studded white gold border. This Celtic necklace has been hallmarked 14K gold by the Irish Assay Office at Dublin Castle, Ireland. 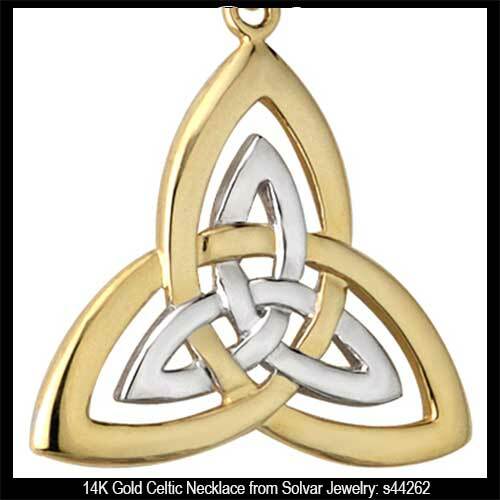 Gold Celtic necklace is a traditional Trinity knot that is studded with diamonds. 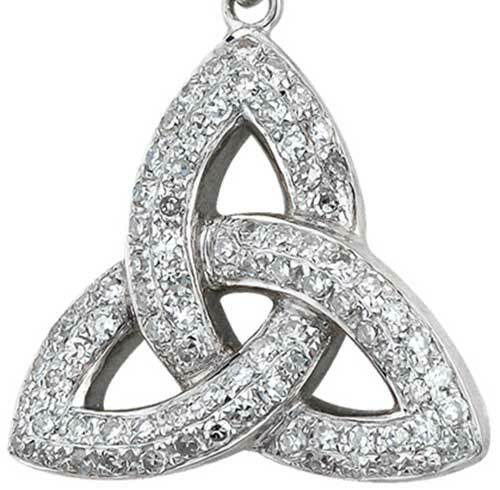 Diamond Trinity necklace is a 14K Celtic design that is enhanced with a white gold border. Celtic necklace is a 14K gold design that is enhanced with an emerald in the center along with an engraved white gold border. 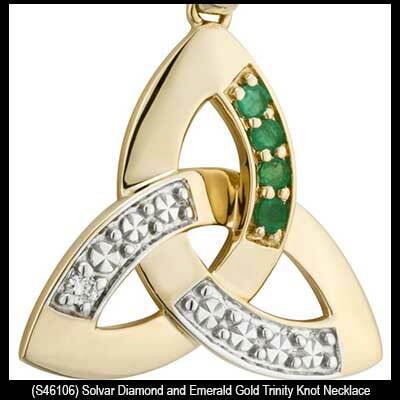 Celtic necklace is a large filigree Trinity knot that is crafted in 14K gold and is enhanced with emeralds and diamonds. 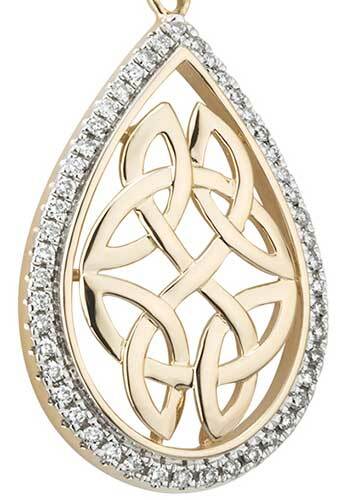 Celtic necklace is crafted in 14K gold featuring a spiral motif with diamonds. 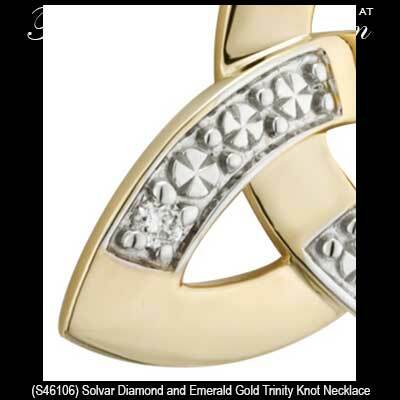 Dara knot necklace is a 10K Celtic design with a diamond accented white gold border. This Celtic necklace has been hallmarked 10K gold by the Irish Assay Office at Dublin Castle, Ireland. 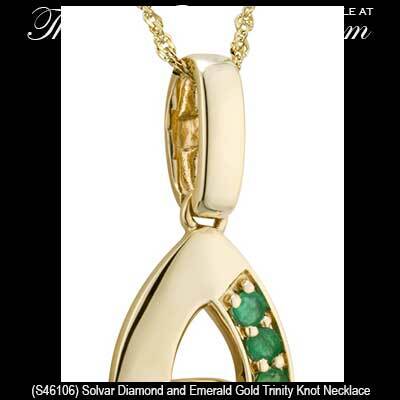 Celtic necklace features a gold Trinity knot and chain that is enhanced with channel set semi precious stones. Celtic necklace is a lucky Irish horseshoe that is crafted in white gold and features a Trinity knot along with diamonds. 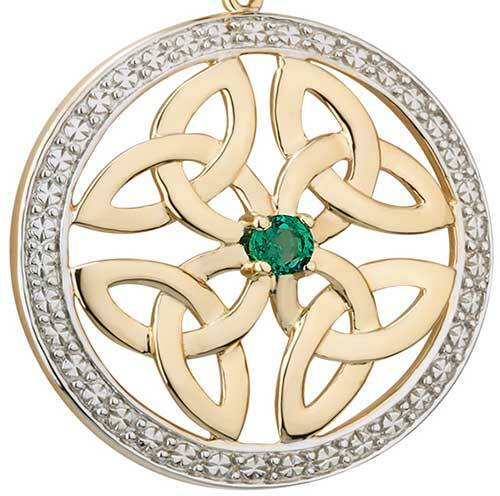 Celtic pendant is a 10K gold design that is enhanced with an emerald in the center along with an engraved white gold border. 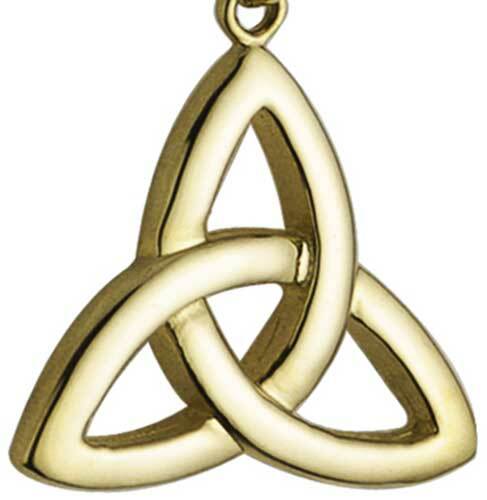 Celtic necklace is a classic Trinity knot that is cast in 14K gold. 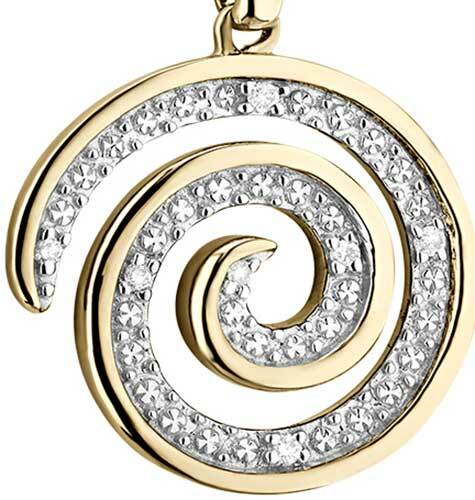 Celtic necklace is crafted in 10K gold featuring a spiral motif with diamonds. 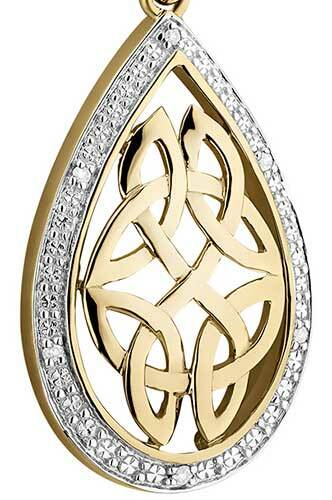 Celtic necklace in 14K gold features a diamond studded Trinity knot. White gold Celtic necklace is a heart shape design with a Trinity knot along with seven precious stones. Gold Celtic necklace is a heart shape design with a Trinity knot along with seven precious stones. 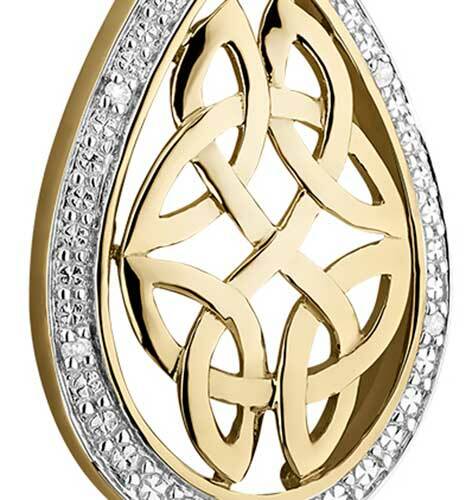 Celtic necklace features a white gold Trinity knot nesting inside of the larger yellow gold Trinity knot. 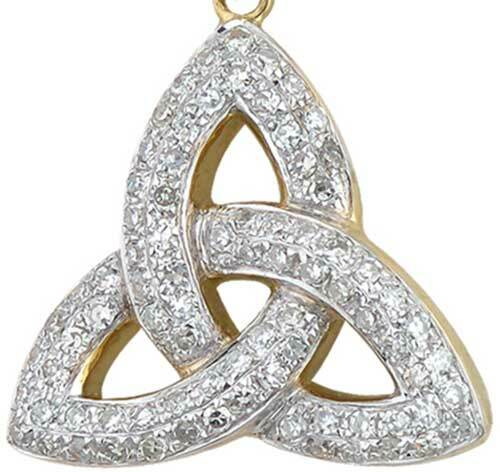 White gold Celtic necklace features the Trinity with an interlaced circle. Celtic necklace is a white gold heart that features a superimposed rose gold Trinity knot with an accent diamond. 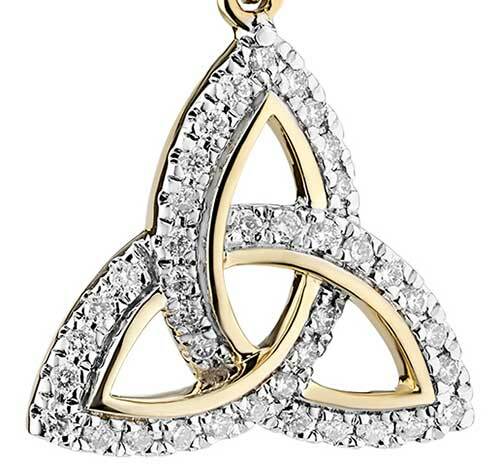 Celtic necklace is a gold heart that features a superimposed white gold Trinity knot with an accent diamond. Celtic necklace is a gold design that features a fancy Trinity knot with an intertwined white gold circle. Thank you for visiting one of the largest collections at The Irish Gift House and we hope that you found the perfect pendant. A pair of gold Celtic earrings with stud, hoop or drop fittings may prove to be the perfect complement to your necklace selection. You may also wish to consider the sterling silver Celtic earrings along with the plated Celtic earrings that are offered in various color tones. Additionally pieces that are worth examination are the Tree of Life earrings and the Tree of Life necklaces; many of these designs have Trinity knot accents that will harmonize with many other styles including the Celtic rings. Other considerations include the sterling silver Claddagh necklaces along with the Connemara marble necklaces that will compliment just about anything that we offer such as the Newgrange jewelry or a sterling silver Celtic band.